Drupal is one of the most popular open source content management system used for building everything, starting from personal blogs to applications for enterprises. Several thousands of add-on designs and modules help in building any kind of website of your choice. Thus learning Drupal is an added advantage for any present day web developer. But the problem is reduced with the launch of the book, quite interestingly titled ‘Drupal 7 Cookbook’ by author Dylan Spencer James. Available in paperback edition, and written in the form of a cookbook, this book is enriched with over 70 techniques, rather recipes, which will help people from all domain of knowledge, that is, starting from beginners to experts. As an overview it must be mentioned that the book is divided into three basic parts. 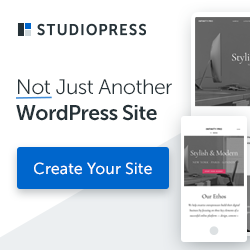 The first section deals with the installation, setting up and management of a Drupal site and also discusses the technique of getting the best out of display of contents and creations. The second part makes you familiar with creation of new types of contents and using them for the creation and publishing of contents views and panels. The final part teaches you how to work with documents, images and videos and the process of integrating them with social networking giants like Facebook and Twitter. Even you will be able to develop themes like the Zen starter and other custom cross browser themes compatible with Drupal including those for mobile devices. Some of the other things taught by this book include creation and working with content nodes, organizing the site with menu blocks and blocks, working with custom content types and views and building pages using the panels. In addition to these, you will also be learning how to personalize your site with an image slideshow, document library and custom built Drupal 7 themes, learn the process of providing multilingual contents for your site, manage roles, user accounts and permissions and how to optimize, maintain and back up the Drupal site. 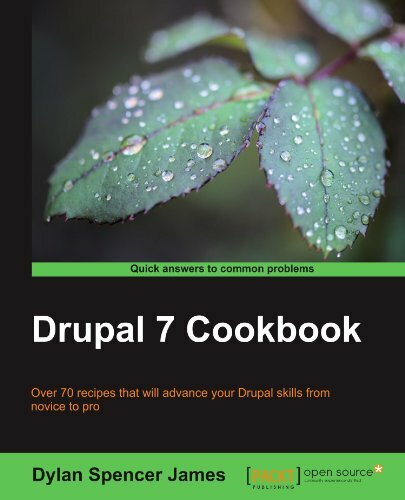 Although targeting for people familiar with web development concepts, this book also serves as the practical guide for Drupal 7. With the rapidly growing world of online businesses, website building has become a common practice for everybody. More or less every techie is trying their hands on website building. 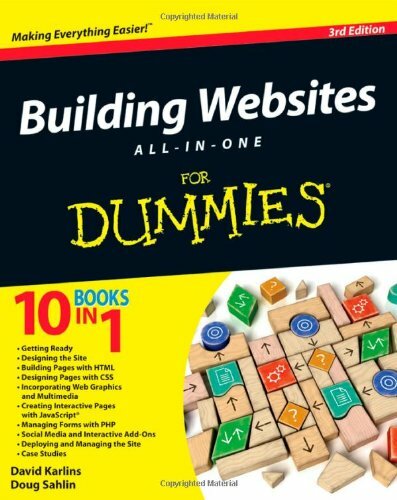 To add icing to their cakes, there is a book titled ‘Building Websites All-in One for Dummies’, jointly written by David Karlins and Doug Sahlin. Unlike other books concentrating on particular topics, this over 800 page hefty book is a combination of 10 small books serving as a start-to-finish roadmap in building websites for both professional and personal purposes. This book is also helpful for a complete newcomer in this field, as it is packed with all the things required for building a usable, attractive and working site. Apart from providing a thorough reference on the basics, the 3rd edition of this book also deals with the latest tools and trends like site planning for mobile devices like tablets and smartphones, connecting with social media, etc. This book mainly targets the designing, planning, building and launching of the most amazing and useful websites. Even if you are stuck in the middle with any technical jargon, this book provides an easy step-by-step guide for solving such problems. The book stands out in its simple and vivid way of writing which allows the reader to catch up the things very quickly. Within a few days of reading this book, you will be practically trying your hands upon designing interactive pages, mobile platform designing, social media integration and many other things. Drupal is one of the best Open Source CMS and Blog applications. It enables you to easily create and manage your news- and articles-based website. Drupal is free to download and use, and is suitable both for small and large dynamic content sites. Drupal is sometimes described as a “Content Management Framework”as its capabilities extend from content management to enabling a wide range of services and transactions. Although Drupal does offer a sophisticated programming interface, basic web site installation and administration can be accomplished with no programming. Drupal runs in many environments, including Windows, Mac OS X, Linux, FreeBSD, OpenBSD, Solaris 10, OpenSolaris and any platform that supports either the Apache (version 1.3+), or IIS (version IIS5+) Web server and the PHP language (version 4.3.5+). Drupal requires a database such as MySQL or PostgreSQL to store content and settings. 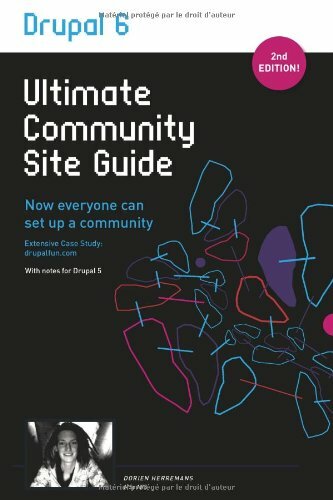 This book gives you insights in the techniques and technologies for building successful websites and online communities. You will learn about this powerful free software’s ins and outs, become a community-building expert and examine successful Drupal sites. Get this book if you’re a web professional, developer, designer, and decision maker interested in applying Drupal knowledge. This book covers an excellent introduction to the nuts-and-bolts of architecting and building Drupal sites. Examine dissections of some of the most popular Drupal sites out there and learn about important topics such as the processes for building and growing successful Drupal websites. 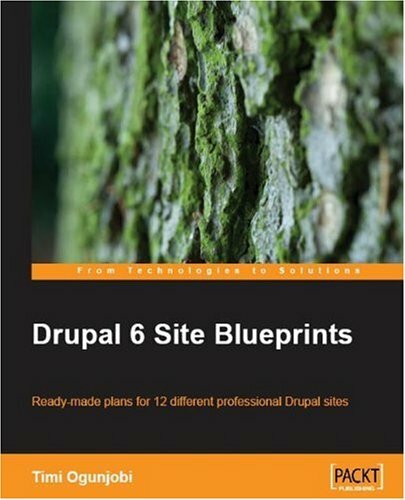 A large number of screenshots will guide the reader through the process of setting up a community site with the Drupal 5 or 6 framework. A number of popular topics, such as profiles, picture and video galleries, maps, messaging, groups, friends etc are discussed. Drupal is one of the best content management systems (CMS) around. In fact, it has won the Best PHP 2009 Open Source CMS Award and is a 2009 Webware 100 winner for the third time in a row. For about 9 years now, Drupal has been providing users with one of the best and most versatile frameworks around. The reader will be guided through the different modules and configuration settings needed to build a solid community site. And we go even further, by looking at how to structure content and making a few $s from your site. It is going to be an exploration of modules and their features. The main strategy of this book it to use only out-of-the-box, user contributed modules. So anybody can make a great site. This well thought strategy offers us the following advantages: 1. Easy to update. 2. Anyone can do it. 3. Expansive: at any time, you can install a module safely, to allow additional functionality. Every function will be explained using the fully integrated case study Drupalfun. Anyone can build a social networking site with Drupal after reading this book. Drupal is a powerful CMS used to build all kinds of web sites. 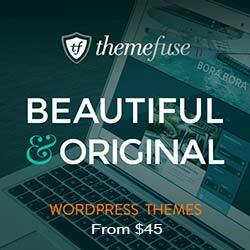 But when you’re urgently tasked with building a specific kind of site, it’s not always obvious which plugins to use or where to begin. If I could show you simple directions to create Drupal web sites for personal or business use within a day, without the initial need to bother about the in-depth details of using Drupal, would you be interested? Build first learn later! The hands-on example projects in this book are based on fictitious web site development briefs, and they illustrate practical ways of applying Drupal. The book dives straight into the process of constructing the featured projects. A chapter is dedicated to each example web site project. Each chapter contains a fictitious brief from which we derive the list of core and contributed modules that we will require to implement the project. Then each chapter progresses into step-by-step instructions for building the web project, aided by the extensive use of screenshots. When you have completed each project, you will have the knowledge and confidence to apply the techniques you have learned to create your own custom web application. This book is for anybody who wants to build a range of Drupal sites, and see how to apply the many available Drupal plugins and features in different scenarios. 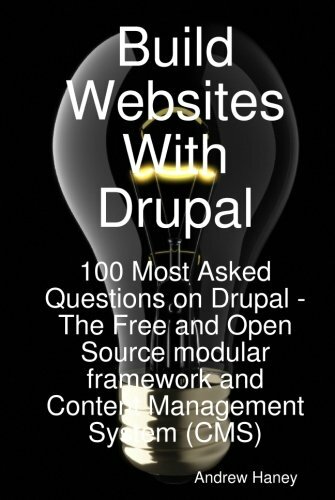 If you develop Drupal sites professionally, or would like to try building web sites as a freelancer, this is a great book to help you get started.